For a self-guided tour, use Garden Explorer to locate plants featured in this month’s post. Select a tour in the drop-down menu. The Garden Explorer tour will go live April 1st. There are some four hundred different kinds of rhododendrons in UBC Botanical Garden’s collections. Most of them flower in April, so I thought it appropriate to make this month’s offering include a few of them. But rather than focus on the enormous diversity, this month’s blog features only tree-sized rhododendrons, a number of which are exceptionally well-budded and ready to explode into bloom. It is perhaps fitting, then, to start with Rhododendron arboreum, one of the world’s tallest rhododendrons. The famous Himalayan tree rhododendron is a variable species with a range that includes the mountains of western China and adjacent Vietnam, Myanmar (Burma) and India, northern Thailand, Nepal, Bhutan and Sri Lanka. Plants can grow to an incredible 40 m (130 ft.) in height. The thick, leathery leaves are mostly oblong to about 20 cm (8 in.) long, and the flowers are borne in rounded trusses of about twenty flowers. Variation in the species describes a range in leaf size, vestiture (white to dark brown indumentum of varying thicknesses and hair compositions) and flower colour, including white and various shades of lavender, pink and red. Our largest and most floriferous plants are on Straley Trail west of Lower Asian Way (red and pink flowered plants) and near Farges Trail and Upper Asian Way (white-flowered plants). Rhododendron barbatum (the bearded rhododendron) normally flowers in March (or even February), but chances are that it will still be in bloom for much of April. This is a spectacular rhododendron, native to the eastern Himalayas and southeastern Tibet, known for its peeling cinnamon bark and pinkish stems, bright green 15- to 20-cm (6- to 8-in. )-long leaves with bristly leaf stems (barbatum means bearded) and compact trusses of extraordinarily rich crimson flowers. Rhododendron barbatum is not usually celebrated for its height, but ours, after 40 years of growth, are approaching 8 m (25 ft.) tall, and they show no signs of slowing down. Look for the group just south of Rehder Trail east of Lower Asian Way. Rhododendron denudatum is a beautiful rhododendron from the mountains of western China, poorly known in gardens. It definitely deserves to be grown, or at least appreciated, particularly as some seedling selections gracefully attain tree-like proportions. Many can grow to 10 m (33 ft.) or more with lustrous, heavily textured, 15- to 20-cm (6- to 8-in.) long leaves that are grey- to buff-hairy under, and with tall, rounded trusses of pink to rose-purple speckled and splotched flowers. The epithet denudatum means naked, presumably in reference to the stems and upper surface of the leaves, which are hairless once fully expanded. One of the finest examples of R. denudatum is located in Wilson Glade in the bed above where the crescent of lawn is at its widest point. A somewhat different-looking (but no less attractive) pair of R. denudatum is located at the corner of Stearn and Upper Asian Way. Rhododendron fortunei is consistently rated as among the most attractive and worthy of temperate rhododendrons in cultivation. 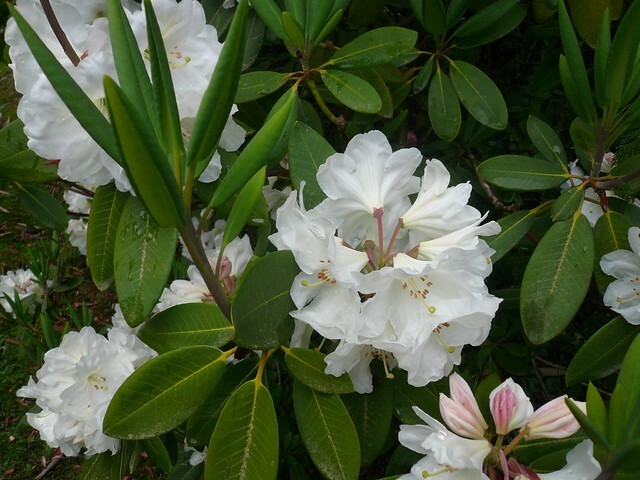 Because of its sturdy, tree-like habit, large, fragrant, abundantly-produced flowers and attractive leaves, R. fortunei was also one of the most commonly used parents in early rhododendron breeding. In the early days, rhododendrons were bred for large estate gardens, whereas nowadays, the tendency is for producing dwarfer, shrubbier plants. Fortune’s rhododendron grows to 12 m (33 ft.) tall (usually less in cultivation) with strong, sturdy, twisting stems. Its leathery leaves are usually 8 to 14 cm (3 to 5.5 in.) long, with a characteristic purple-flushed petiole (leaf-stem), which distinguishes the species from the similar R. decorum when they are not in bloom. Like R. decorum, emerging leaves are often coppery to bronze purple. The name fortunei recalls Robert Fortune, the Scottish collector who, venturing to China in 1842 for the Horticultural Society of London, survived an attack by five pirate vessels in the South China Sea before he even landed to start collecting. The leaves in R. fortunei subsp. discolor are mostly longer and narrower than in subsp. fortunei. The broadly funnel-shaped flowers of both subspecies are mostly pale pink (or bright pink in some selections of subsp. discolor), borne in lax inflorescences of six to twelve flowers. Our most impressive R. fortunei plants are located at Kingdon Ward Way at Henry Trail and on Siebold Trail at Rehder Trail, while the largest plants of subsp. discolor are on Decaisne Trail just north of Forrest Trail and on Ludlow Trail, across Lower Asian Way from a fine R. decorum. These plants are all closely related to R. vernicosum (differing in a few details of the flowers) of which there are several 8-m/25-ft.-tall specimens on Lower Asian Way opposite Cox Trail. Rhododendron rex subsp. fictolacteum is one of the hardiest of the “big-leaf” rhododendrons, this plant grows in pine forests in the high mountains of southwest China and adjacent Myanmar. An arborescent rhododendron, fictolacteum eventually grows to more than 10 m with sturdy branches. The paddle-like, deep, shining-green leaves can be 20 to 25 cm (8 to 10 in.) long, and the ample, bell-shaped flowers are white with purple spotting. These are freely borne in tight globular trusses about 12 cm (5 in.) across. The undersides of the leaves have a beautiful cinnamon coloured indumentum. The name rex means “king,” for the large size of these plants, and ficto = fiction (i.e., not true) + lacteum. This plant was originally, mistakenly, attributed to R. lacteum, an unrelated species with pale yellow flowers, which will be in flower a week or so later. Our best flowering fictolacteum is on Flanagan Trail, just west of where it terminates at Lower Asian Way. Rhododendron falconeri, a close relative noted for its creamy yellow, white or pink flowers and even larger leaves (to 30 cm/12 in. long) with long petioles (leaf stems). The leaves are initially completely covered with a vestiture of dense brown hairs, but this wears off the upper surface once the leaves are fully expanded. This is a truly magnificent species, growing to 15 m (50 ft.) in its native eastern Himalayas. The species gets its name from Hugh Falconer (1808-1865) a Scottish geologist, botanist, palaeontologist and paleoanthropologist who study the flora and geology of the area. Our largest yellow-flowered falconeri is on Handel Mazzetti Trail just west of David Trail. Directly across and along Flanagan Trail to the west of the aforementioned fictolacteum is a group of sturdy arborescent rhododendrons labeled R. sutchuenense and R. calophytum, both species in the fortunei group from western China. Rhododendron sutchuenense (sutchuenense = from Sichuan) has large, smooth, matt-green leaves up to 30 cm (12 in.) long that are usually broader near the tip and that are typically recurved along the margins. Plants bear very large, pink flowers that open widely to display tiny red spots. The flowers are borne in trusses of eight to twelve. Rhododendron calophytum (calo = beautiful + phytum = plant) exhibits paler, more boat-shaped leaves that are larger still. The flowers of R. calophytum are equally large, but white to pale pink, with a deep raspberry blotch in the throat. Flowering is often very early in March, but cool weather will extend the magnificent blooms into April. Both species are known to grow well over 10 m tall in the wild. Observant visitors will notice that some of the plants labeled R. sutchuenense have flowers with both blotches and spots. These are actually R. x geraldii, a hybrid of R. sutchuenense and yet another close fortunei relative, the March-flowering R. praevernum. Look for this species on Stearn Trail west of Decaisne Trail. Ours is a mere baby at 5 m (15 ft.) tall. We have to agree! Thanks for sharing your feedback. Have you had a chance to click the link to Garden Explorer at the top to see the interactive tour that goes along with this month’s post? No surprise that it is amazing considering the author. Hi Allison, thank you for the positive feedback about our new Garden Explorer tool. We’ve been working on rolling it out for a few years now and are thrilled with the ability to share our collections online and also use the tool to better manage our plant collections. We are glad you like it. Stay tuned for more exciting updates to Garden Explorer like the addition of a “feature plant” like we have at our Garden’s entrance area. I just took a quick look at April in the Garden and started to read abut the Rhodos. Then I went into the Garden Explorer and saw where each tree was located and saw the photo and info about it. This is the real thing – no April Fools joke. I am totally ‘gobsmacked’ by this. Well done and thank you.